How can it best be described? In my view, it is simply a fear of the future. Fear of the unknown, whether days or minutes in advance. Whether it’s a job interview, a family gathering, a doctor’s appointment, we all get anxious from time to time. But when it interferes with our everyday existence to the extent that we don’t want to even go out of the front door, to meet our friends or simply to go to the shops, that is the time to seek professional help. I suffer from crippling bouts of anxiety. To start with, I’ve had clinical depression since 2007. The anxiety has got worse in the last two to three years. I can go months without anxiety rearing its ugly head, but on other occasions it can strike without warning, sending me into a spiral of isolation and despair. Take the other week for example. I had come down from two anti-depressants to one, a big drop, not without its pitfalls. I thought I was doing well, life was generally good. Everyday living was fine, and I thought the pain and suffering was over. When you start getting complacent and thinking this is finally done, anxiety comes into play and hits you hard, very hard in fact. 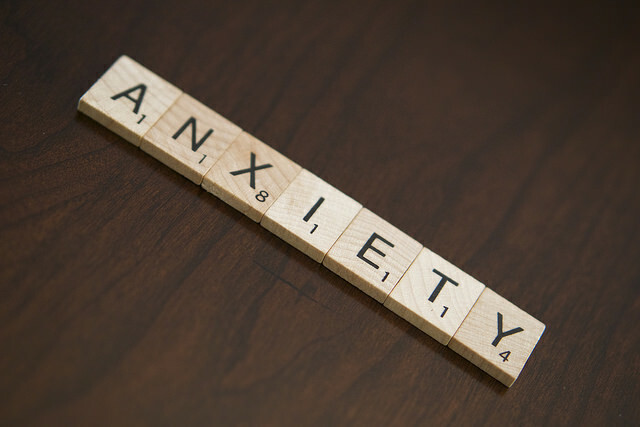 What are the symptoms of anxiety? Well there are many, but the symptoms I get are standard for most people with this problem. Racing heartbeat, as though my heart is coming out of my chest, fear that something bad is going to happen (though it doesn’t), wanting to isolate myself, tightness around the neck as though someone is strangling me. The anxiety wells up from the pit of my stomach and rises like steam, manifesting itself in these symptoms. It’s terrifying, scary, and maddening all the same time. Why is this happening? What can I do? So many questions without answers. I go to CBT (Cognitive Behavioural Therapy) to try and talk my anxiety out with a trained counsellor. Even I get anxious before going there too! And I had a dreadful happening the other week when I went to see my doctor. The above symptoms were in evidence, so much so in fact, that I don’t know how I made it to the surgery. Now this is another strange quirk of anxiety. The following day I woke up and felt fine, I didn’t have any anxious feelings, I went out without any issues for the next four days. Why does it turn on and off like this to the extent that it affects my life? Again a question I cannot answer. So now you get the picture. The unpredictability of it all really drains me and tires me out. I have been having the odd suicidal thought, only fleeting mind you, but they have been there. I want to be free from this agony. I’ve deserted my friends and family to the extent that I AM ISOLATED, it’s not something I want to happen, far from it. Do people understand? Well, most people do, but their reservoir of patience runs out in the end, and that causes more problems. The mind is a very peculiar machine. When it runs well, it’s a great thing. When it doesn’t it causes heartache and pain beyond measure. I have some good moments, but I want to be free from anxiety completely without the need for medication or worse. It’s having a major impact on my life that could be irreversible if I don’t act fast. Submitted by Ian Fullbrook, a wonderful friend I met through this website from England. Give his blog a follow to keep up with his wonderful thoughts. Sounds really tough, I’m glad you’re ready to Act!! Sounds tough, glad you’re ready to act! Can’t believe the kind words and likes I’m getting for this post! Thanks for the kind words and thoughts on the piece. At the moment, things have calmed down somewhat, but I have to be wary of the next anxiety attack. Blogging certainly helps and gets my thoughts down better than I’d imagined. Wishing you good luck. I truly understand… I too have a lot of anxiety… It might sound funny but I even get anxious about going to school, in fact it’s hard to even to think of being among 6-7 people. And the attacks! Terrible! Feels like I would die – can’t see, can’t breathe, that racing and somersaulting heart and shaking all over in panic! Hope you are able to recover, best wishes.